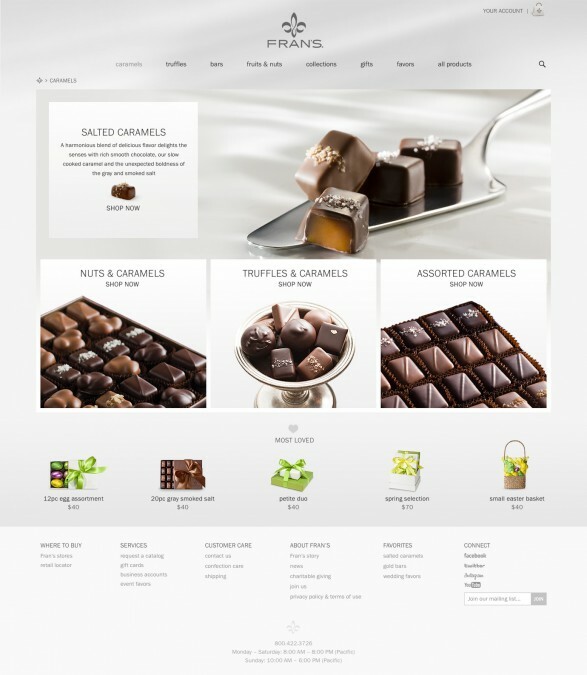 Fran’s Chocolates, a world-renowned artisan confectioner needed a full site redesign and eCommerce implementation with back-office fulfillment, shipping, and accounting integration. Challenge: Design and develop a world-class eCommerce website which seamlessly integrates with existing business processes while matching Fran’s devotion to quality and commitment in all customer experiences – in a 90-Day turn around. Solution: Working closely with Fran’s, we created an eCommerce site supporting product purchasing as well as communicating the fundamental nature of the brand. To accomplish this endeavor we took a focused research and requirements definition phase which mapped out a “delicious” front-end experience (IA / UI / UX). This was married to a customized commerce engine which integrates seamlessly into their product catalog and accounting system. Result: Simple, beautiful, and effective. The end result is a rich and immersive experience which conveys the essence Fran’s Chocolates—crafting each interaction with the same care and consideration that goes into every aspect of their business. Fran’s has seen in upwards of 450% return on investment since the site launched in 2007.